The Legend of Zelda: The Wind Waker</em> was first released on the Nintendo GameCube back in 2003. 10 years on, Nintendo has re-released it with an HD coat of polish. Has the game stood the test of time? The Legend of Zelda: The Wind Waker was first released on the Nintendo GameCube back in 2003. 10 years on, Nintendo decided that with a distinct lack of flagship software titles for the Wii U, it would be pertinent to release a ‘remastred’ version of one of their older Zelda titles, hence The Legend of Zelda: The Wind Waker HD. For anyone not familiar with this particular Zelda title, the story and graphics are quite unique. The story takes place several centuries after the events of The Ocarina of Time and most of the world is now covered in water. So think Waterworld but without Kevin Costner or everything that made the film so very, very awful. The main series antagonist, Ganon, is up to his old tricks again and is capturing maidens on isles dotted around the world. His hope is to find Princess Zelda so he can steal a part of the Triforce that she has latently within her. However, Ganon doesn’t factor in his plans a boy from a small island (Link - but then, you knew that already) that has come to rescue the Princess Zelda and fulfill the heroic duties of the past Hero of Time (also Link) from the Ocarina of Time. I’m fully aware how incredibly messed up and confusing the Zelda series canon is, but bear with me please! Gameplay is the usual 3rd person perspective affair seen in almost every 3D iteration of the Zelda series. The main difference being that travelling doesn’t take place with a horse across ground, but instead on a boat across vast seas of water. Travelling by sea and collecting items from different islands to unlock new dungeons and then repeating this process until the end of the game is pretty much the name of the game, and as repetitious as that sounds, the game isn’t without its side-quests and explorable locations. I will now admit a slightly shocking and shameful secret that I must now sadly confess: I never completed the original game because I found the sailing to be incredibly boring and lacking in variety. Sadly, this hasn’t changed much in the remaster, save for the fact you can later purchase a faster sail for your ship. The isles that you do find aren't particularly varied and the area they cover is miniscule. While the world is very large, this lack of variety doesn’t give you much incentive for going off the beaten path, and most will probably just stick to completeingthe main game’s story. This remaster does improve and refine gameplay in the sense that it trims down a tedious and quite controversial Triforce Quest later in the game. Instead of collecting a Triforce Sea Chart (map) for each 5 Triforce shards, you only need to collect three Triforce Sea Charts. Speaking of sea charts, the game now gives out other sea charts a lot more easily, and there are more spots in the sea that can reap you a fair amount of extra rupees for your quest. So things have been made a lot easier. That being said, if you want a real challenge Nintendo was nice enough to include a ‘Hero’ mode that basically makes the game a hell of a lot harder, eliminating healing hearts from ever appearing, forcing you to purchase expensive healing potions. Oh, and the enemies do double damage! I wasn't too keen on how the game allows you to change the difficulty from ‘Normal’ or ‘Hero mode’ at anytime whencontinuing from your previous game session. I would have preferred it if the game made you stick with one difficulty and rewarded you for doing so. 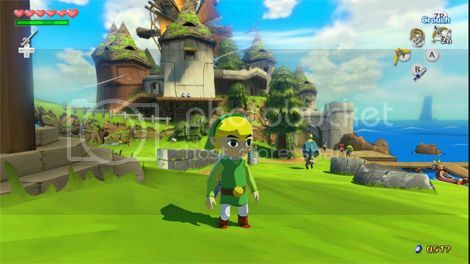 The core aspect of Wind Waker and its re-release is the stylised graphics. The developers use a unique cel-shaded style of artwork and graphical fidelity (later seen in The Twilight Princess, but with more of a realistic character design). 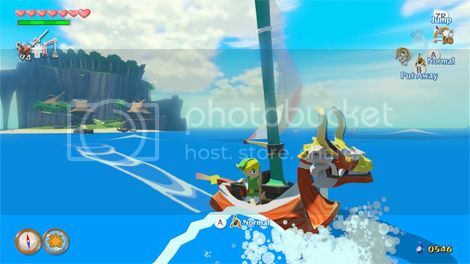 I have to say that the Wii U re-release of Wind Waker has really outdone itself in bringing out the game's colourful gleefulness in high definition fidelity. I maintain that this style of artwork goes against the overall style and feel of the Zelda series, propelling it into a more cartoonish comedic realm rather than one with a serious and atmospheric overtone like that seen in the Ocarina of Time . Although there is a charm to this stylistic direction and it definitely works in the HD release of this game, I still don’t like seeing the main protagonist you control looking like a Japanese chibi character, I just can’t take it seriously (Even if the NES / SNES Link iterations were kind-of designed this way too, this was more because of the limitations of past technology than design choice). 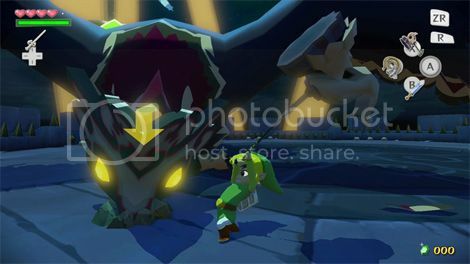 Not all textures in the remaster were spruced up, with the odd wall texture looking ‘old’, as if they forgot to update it from the original Wind Waker game. However these design flaws are few and far between and overall, the game looks gorgeous for what it is. If this was a new Zelda game release then I would tip my hat off to it for being unbelievably dynamic in art design, albeit a bit childish. I would also have commended it for trying a different direction by eliminating the overland exploration seen in older Zelda titles with a large open sea design. However the fact of the matter for me is that while the game production has the usual over-and-above quality seen in Nintendo 1st party titles, I feel the original idea of having such an empty sea with very small islands to explore kills the incentive for exploration, something that is key for a Zelda title. The refinement in gameplay makes this the ‘superior’ version of the game, however there hasn’t been that much change added , and not that many extras besides the graphical and gameplay refinements. One of the biggest I,provements for me were the controls which are by far the best out of most of the 3D Zelda titles to date. This is mainly because the Wii U’s GamePad button layout functions much like a more modern SNES controller. The touch screen allows you to read sea chart maps and swap out items / equipment really quickly when compared to the original’s obtuse and bizarre GameCube controller. It’s definitely a breath of fresh air (So, take note Nintendo – Please more of these controls in your future titles!). In the end, The Legend of Zelda: The Wind Waker HD is a fantastic title, however more so for those who weren’t of age or lucky enough to witness the original when it was fresh and new back 10 years ago on the GameCube. I still feel this is a gem of a game and Nintendo really tried their best to make this title look as new as possible, but it's still definitely not the best Zelda game in the series.